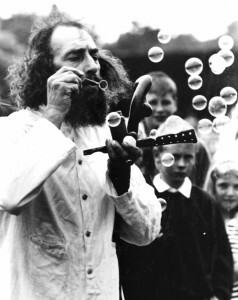 In the summer of 1988 the Wizard received a request from the A&P Show committee in Waimate (a small town in South Canterbury) to attend their annual Agricultural and Pastoral Show with the aim of doing something to break their drought. There had been rain in nearby districts but not a drop had fallen on Waimate for six months and the area was completely barren. Stock had been sent away and the show was only being held because it functioned as an important social gathering for people from all over the district. Inspired by the old Hollywood film “The Rainmaker” (starring Burt Lancaster and Katharine Hepburn) the Wizard decided it could do no harm and would certainly cheer up the depressed locals to try out his skill as a rain-maker. He informed the A&P Show organisers he would accept the challenge and would design a special rain dance for the occasion. As soon as the local Assembly of God heard that the Wizard was coming to do a rain dance they were enraged and demanded that A&P Show committee cancel the invitation. They put pressure on the mayor and council and said they would withdraw financial support from the show. A battle between the forces of Good and Evil broke out. The mayor and show committee wouldn’t back down and the media, who thrive on such things, made a big issue out of it. 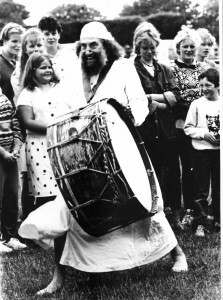 When the Wizard arrived in Waimate some weeks later it still hadn’t rained and the local population and curious TV crew were abuzz with anticipation. Slowly the Wizard assembled his rain-making equipment, which included four buckets of water, a horn, an umbrella under which hung a small red demon, a large bass drum, his magic staff, and a mug of beer. No sooner had he begun his circular gyrations whilst beating his drum, than a strange black cloud, more like smoke than water vapour, appeared over Waimate. An hour or two later torrential rain began to fall and the show was washed out. This time the rain, which fell all night and on into the next day, fell mainly in the Waimate valley and by-passed other regions. A day or two later a whole page of the New York Times was devoted to the Wizard and his spectacularly successful rain dance. This was the first time the name of the town of Waimate had been trumpeted abroad. The Wizard does not accept payment for weather magic but only expects the recognition due to his courage in undertaking such a risky business where failure means much mockery from both believers in God and believers in Nature. On this occasion it occurred to him that the district could show it’s gratitude and at the same time solve it’s major economic problem of being three miles off the main north-south highway and being by-passed by all the tourist buses. Japanese tour buses would thunder into Waimate bringing a thriving trade in rain dance memorabilia and older residents could entertain visitors with eye-witness accounts and would never need to buy their own drinks during the tourist season. Alas, the request met with bitter opposition from the Wizard’s main rivals, the churches in Waimate, even though it was obvious that God must love the Wizard more than them since He had withheld the rain in spite of their prayers and sent it when the Wizard danced. Unless of course the rain was “satanic”, in which case the farmers shouldn’t take advantage of it. The Wizard’s shrine was never built and Waimate still languishes as a rarely-visited rural backwater. Following this well publicised “supernatural” occurrence. The Wizard received a call from the city of Nelson. This time the crisis was an urban water shortage. Due to the unusual failure of the winter rains, the reservoirs were dangerously empty. Once again the mayor requested the Wizard’s aid, and once again he performed his rain dance. This time it was performed at the bottom of the beautiful cathedral steps. There were no religious detractors of any significance since Nelson, besides being a centre of arts, crafts and viniculture is also, like Christchurch, an Anglican cathedral city. As he commenced his stately circlings, horn blowing, drum beating etc.to his great joy the Cathedral bells rang out. Once again the rains came to the call, but only after three days. The reservoirs were quickly filled by the continuous downpour. This time the Wizard only claimed half the credit, modestly conceding that the God of the Anglicans should also be thanked. This time there was no media coverage as there was no public hostility or unpleasantness. Two months later, on visiting Nelson on business (blessing a new shop), The Wizard found it was still raining and received many complaints and angry requests to “turn it off”. There were no major droughts or urban water shortages for some years after this, then in April 1994 the Wizard was approached to perform by a public relations firm in Auckland who represented Watercare Services. Auckland, a city of over a million inhabitants, was in a real crisis owing to the failure of winter rain over the reservoir catchment areas. The crisis was so grave that no baths were allowed and toilets were only flushed when essential. Emergency plans were being rushed through Parliament to authorize a pipeline to the Waikato river in spite of the great cost, and potential impact both on the environment and on the extremely sensitive nature of Maori land owners. The Wizard pointed out that he would not intrude on other peoples territory without being invited by the legitimate authorities and asked the firm to arrange an invitation from the four city Councils that administer Auckland. Only one city council, North Shore, showed any interest, the others just did not want to know. The Wizard received a delightful letter of invitation from North Shore (with a charming little poem) looking forward to his visit and informing him that no doubt lots of children would love to be present. The date was set for late May, unless of course it rained before then. Then, a day or two before his departure, like a thunderbolt out of the blue, the Wizard received a letter from the North Shore city council regretting they had to cancel their invitation as they had received a massive number of complaints that, since the Wizard was a practitioner of the black arts, he should under no circumstances be allowed to come to Auckland and perform a rain dance. Presumably, their prayers having failed, they were not keen to suffer the fate of the Waimate fundamentalists. The talkback radio stations, that are very popular in Auckland, were dominated for several days by a very serious debate as to whether the Wizard should be allowed into Auckland to do his rain dance or not. Everyone outside Auckland was amazed and justifiably alarmed at the revelation that the city was being influenced and even controlled by a powerful and influential group of religious maniacs. Then a fax arrived from an unknown wizard in a small town just north of Auckland offering to help in winning the spiritual war that was raging there. Naturally dubious of the credentials of a wizard he had never heard of, the Wizard made further enquiries. Wizard Ron was a Yank living in Silverdale where he and his wife Paula, a Kiwi, ran a small shop selling Mexican silver. He was on good terms with the district mayor and local businessmen’s’ association. He believed it would bring credit (in both senses of the word) if the Wizard were invited, all expenses paid, to perform his “wicked” rain dance in Silverdale. The mayor of the Rodney District sent the invitation and a few days later, in a blaze of media publicity, the Wizard arrived to dance in the main street of tiny Silverdale assisted by his new Yankee chum. To ensure success a helicopter was chartered to fly the Wizard over Auckland city whilst he made suitable gestures and chants to encourage precipitation. At the same time his voice was broadcast over a local radio station. He urged the population down below to look up and, when they saw his plane, to demonstrate their support by doing a few dance steps or their disapproval by shaking their fists. The Wizard then returned to the South Island to do some tourist magic for the ski fields in Queenstown. Three days later, without warning, the rains came. And came. And Came. It has now been raining heavily in Auckland, for more days than not, for almost three years. In spite of receiving a large number of private letters politely requesting him to return to Auckland to stop the rain, he has made it quite clear that, until one or more of the four city councils who run Auckland writes to him to communicate their thanks for saving them from a serious crisis, he will just let the rain continue unabated. To date no official thanks have been received. This incredible story does not end here. The final (?) chapter took place a few weeks after the Wizard won the battle over the souls of Auckland. He received a phone call from radio station 2GB in Sydney begging his assistance to break the catastrophic seven-year drought in the outback of NSW and Queensland. This time he hesitated before putting his hard-won reputation as a miracle -worker on the line. He decided to try his “luck” just one more time and once again insisted that it be at the at the invitation of a city or district council. The mayor and council of Tamworth in NSW and the local shire council jointly invited him to perform his legendary rain dance in their region. The media attention waiting for him on arrival in Sydney was hard to believe though the general mood was, to put it mildly, one of extreme scepticism. The Wizard announced that should his rain dance break the drought the only reward he wanted was the title of “Wizard of Australia”. He was already the official Wizard of New Zealand and wished to combine the titles to become “Wizard of Australasia”. On arrival at Tamworth he was warmly welcomed by the mayor and shire president and after a good lunch proceeded to a sun-backed paddock under a blazing sun in a clear blue sky. 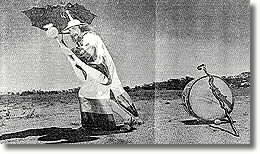 In the presence of a small gathering of bankrupt farmers and Aboriginal tribal elders he had invited through his extensive network of friendly nuns, he performed the rain dance once again on rock-hard ground. The mayor was away harvesting his stunted wheat crop “in case it rained”. The TV cameras had travelled with him all the way from New Zealand this time as TV3 knew that this was “a great story”. The rain dance completed, the Wizard returned exhausted to Sydney and was preparing to pack to leave for New Zealand when the news came through that huge storm clouds were gathering over Tamworth and that thunder and lightning were alarming the locals. On arrival in Christchurch the TV news programmes were reporting excitedly on heavy rainfalls in the stricken regions including Tamworth. 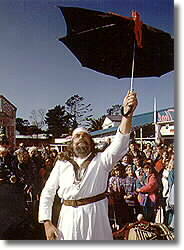 Film was obtained from Tamworth and broadcast in New Zealand showing the rain and interviewing the locals, surprisingly few of whom would openly admit that the Wizard’s rain dance had produced the long awaited rain. Feeble explanations about cloud seeding, local prayers or sheer chance were offered. If the Wizard had failed he would have been the but of everyone’s jokes but when he succeeds no one wants to give him credit. The New Zealanders knew all right and they were filled with pride for their amazing wizard. Dr Dennis Dutton, spokesman for the NZ Skeptics Society, who had unmasked many “new age” rip-offs, stated on national TV that the Wizard is the only individual they have ever come across who possesses genuine “paranormal” powers. Needless to say the Australian Government did not make the appointment the Wizard sought in spite of achieving the impossible. 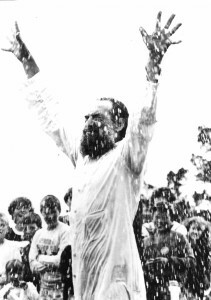 He was particularly irked when shortly afterwards a coastal shower, so common in Sydney, which occurred during the Pope’s visit to beatify the Blessed Mary McKillop, was taken as a true miracle and a sign that she is a genuine saint. What’s Cool on the Aboriginal Pre-literate Internet? On the positive side, being a primitive “throwback” himself, the Wizard is still chuckling about what is being said in the powerful oral Aboriginal tribal network about the appearance of an ex-university academic, Anglo-Saxon wizard from New Zealand who performed a successful rain dance right before the eyes of their representatives on the prestigious Land Rights Council. Owing to the complete lack of appreciation from civic and state government authorities for his efforts on their behalf, and the massive storm of hatred he has brought on his head from rich and politically influential fundamentalist Christian leaders, the Wizard has now retired from rain-dancing and restricts himself to the occasional spell to bring snow to the ski-fields.